The Capitol Riverfront Business Improvement District reports that the neighborhood is expected to generate $287 million in revenues for the District in 2018, 3.5 times what it generated before the BID was created in 2007. WASHINGTON — The District allocated has $1.1 billion in taxpayer money in infrastructure improvements and other investments since Navy Yard revitalization started to kick into high gear a decade ago, and according to a new report. It is about to break even on that investment. The Capitol Riverfront Business Improvement District’s report, called “Riverfront Recaptured,” said the Capitol Riverfront neighborhood is expected to generate $287 million in revenues for the District in 2018, 3.5 times what it generated before the BID was created in 2007. Based on revenue generated for the District’s coffers in the last decade, that $1.1 billion investment will have paid for itself this year. The Capitol Riverfront BID also said that by 2025, the District will have made back double its investment in the neighborhood. The BID’s report also said the private sector has more than matched the District’s contribution to Capitol Riverfront, with $1.92 in private investment for every dollar in public investment. It forecasts the per dollar co-investment will more than double in the next four years and exceed $8 by 2035. Capitol Riverfront is only partially built out, with 14 million of an envisioned 37 million square feet when it peaks in 2040. The BID estimates the net fiscal impact by then will be a cumulative $8.3 billion. This year, Capitol Riverfront businesses will generate three times more real property tax revenue than a decade ago, four times more income taxes and five times more sales, meals and hotel tax revenue than in 2007. The speed of growth in Capitol Riverfront is brisk, with the current population of 6,000 residents expected to double by the end of next year. Already, 34,000 people work in the area. 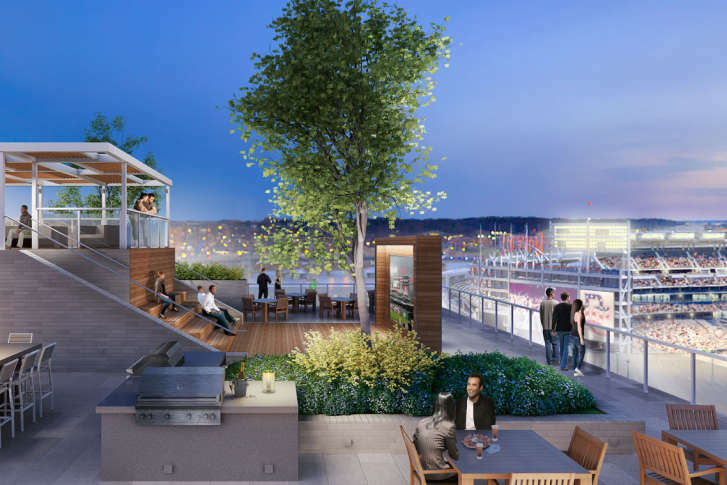 At least one residential building or restaurant is opening in the neighborhood every month, and the neighborhood now has more than 10 acres of parks, some of them waterfront. Capitol Riverfront, on 500 acres between Interstate 395 and the Anacostia River, is now one of the most densely developed areas in the District.